Works of art have histories – personal and collective. In January, American realist painter George Nick came to the Ackland with our former director, Charles Millard. 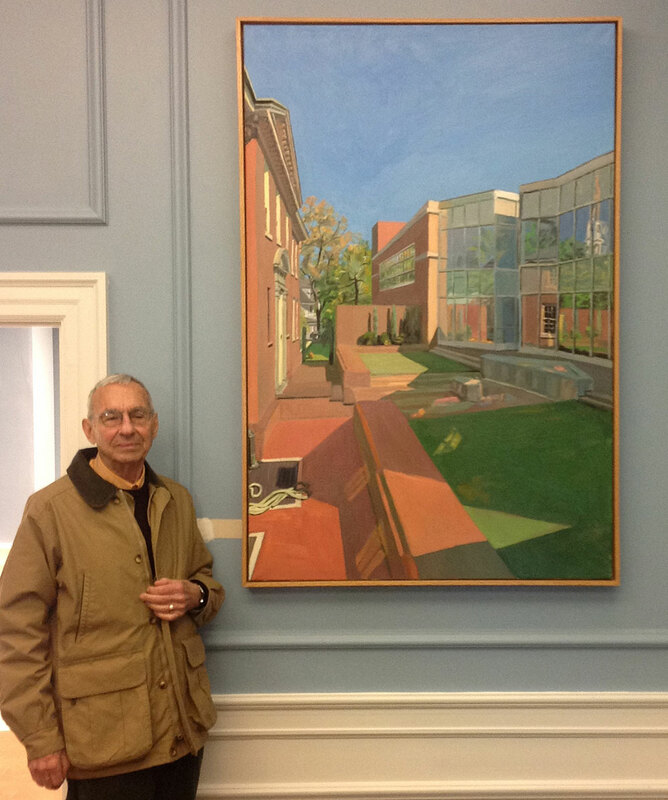 Nick’s painting, seen with the artist at right, was recently pulled from Ackland storage and installed in the office of the Chancellor. This photograph documents the day when the artist rediscovered his old friend: his own work. It is privilege to hold works in trust for the people of North Carolina, but more than this, it is a rare delight to know that museums also facilitate homecomings, moments with artists are reunited with their works. An Indian rickshaw, with poetic verses painted around its rear window, passes through the Ackland’s lobby. In a small passageway between galleries in the middle of the Ackland Art Museum, two identical clocks by artist Felix Gonzalez-Torres—placed side by side and touching—hang on the wall just to the left and above the Ackland’s sculpture Spanish Dance by Degas. It is a quiet presentation, but clearly part of the exhibition More Love: Art, Politics, and Sharing since the 1990s. I suspect that many visitors do not see it, favoring the larger and more actively engaging installations and art works in the exhibition’s main galleries. Nevertheless, when More Love closes on March 31st, I will miss this installation most of all.